Smashwords is a self-publishing website that is very easy to use. I have an excerpt of my Eastern European travel book available to download for free entitled ‘Now Boarding, The Eastern European Express’. For any budding authors out there, I would urge you to give the site a look as they have loads of help and advice to get you going and provide inspiration to write. Below is the author interview that I gave in 2015. Like many I had written a couple of chapters for a travel related book, but that was as far as it went. Then in May 2012 a sporting event happened and an idea for a book instantly popped into my mind. I sketched out the chapter format, wrote a related biography about me and sent off the idea to 3 or 4 publishers who specialised in sports books. Happily one of them commissioned me to write the book. The only challenge was that they wanted it complete by the end of June to capture the pre-season football market. I took on the challenge and managed to meet the deadline. It sold nearly 4,000 editions in paperback and e-book format, so not bad for a beginner. What’s the story behind your last book? 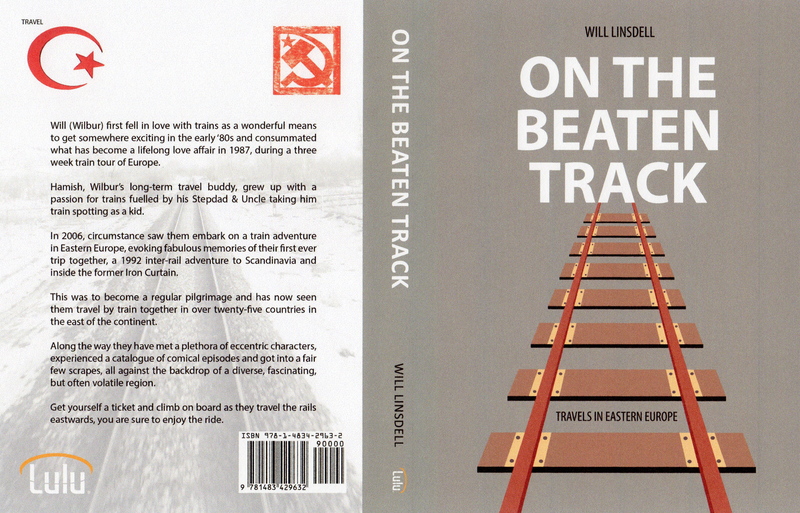 My latest book is based on my travels in the East of Europe. The region fascinates me – it has such a turbulent past and is so diverse geographically and culturally. I find it totally different to Western Europe and that makes a visit there even more special. Much of my journeys in the region have been by train – over 15,000 KM at an average speed of 53 KMH! The fact that things do not move quickly in that neck of the woods just adds to its charm for me. My first peep behind the Iron Curtain was in 1987. We got as far as Maribor in the then Yugoslavia, only to be escorted back to Austria under armed guard. You will have to read the book to find out more! My last visit detailed in the book was in 2014 when I took a train across Turkey to Georgia and on to Armenia. As ever my travel buddy and I encountered a number of mishaps, lots of comical moments and a fair few bizarre characters. My football booked got snapped up as it was a niche subject perfect for a particular moment in time. Travel is that much tougher to break into. Why take a chance on a beginner when there are so many Brysons and Palins out there? My motivation is to get a name for myself with my first couple of books, then who knows……..? I genuinely love writing and to be reminded of so many incredible moments is a great pleasure, far more so than just looking at pictures. I often laugh out loud when I write and my greatest ambition would be to see somebody reading a book I have written and laughing themself. I have started my first fiction book set in Indochina. I had just returned from Cambodia & Laos and have also been to Vietnam in the past. An incident that happened to me in Siem Reap has inspired the idea and the words are flowing right now! I love humorous writers like Dave Gorman and Richard Herring, as well as stimulating and amusing authors like Stephen Fry & Charlie Higson. I have to admit to loving JK Rowling too! When you’re not writing, how do you spend your spare time? I love watching top class sport and of course travelling in the UK and further afield. I am busy at the moment helping my wife set up her business, am looking to start a writing club locally with an author friend of mine, plus blogging and book marketing take up a fair amount of time. Apart from that, playing and walking with my dog and doing some charity work for Marie Curie takes up much of my other spare time. Unbelievably for a keen writer I am a rubbish reader! I have lost count of the number of books that I am two chapters in before I abort. One day I hope to put it right! I did my take on Peter & The Wolf as a five year-old and received three gold stars for my efforts. The stage was clearly set…..
Like the majority of people my life is very busy and I have to constantly juggle tasks. However, it is surprising how much ‘dead time’ people have when you think about. I write on my phone or tablet at every opportunity. Commuting to work, waiting at the bus stop, sitting in a cafe, early in the morning before getting up, that sort of thing. It does not take very long to write a few thousand words and then it is a case of stitching together all your work and embellishing it on your main computer. I am fortunate to have an extremely talented nephew called my Kyle Bean who designs covers for all sorts of national and international magazines (including easyJet’s inflight magazine three times). He designed the front cover for my first self-published book as a graphic design (he rightly told me that this would be the most eye-catching effect), whilst I designed the back cover using a photograph that I took, which I faded out so the book blurb could be pasted on top. Wanderlust Magazine or a World Atlas!